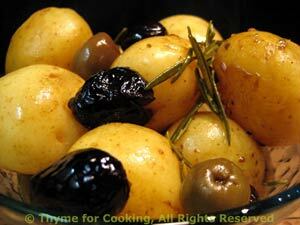 New Potatoes Cooked with White Wine and Olives, Thyme for Cooking sides. If you can't get new potatoes, or the they are large, cut them in half or quarters. The wine, olives and rosemary lend a Mediterranean flavor. Finish with a bit of sea salt, if you like. Leave new potatoes whole; cut regular potatoes in fourths the long way, then in thirds. Put everything into a small saucepan. Cover and bring to a boil. Reduce heat and simmer, gently for 15 minutes. Uncover and continue cooking for another 15 - 25 minutes, depending on size, until potatoes are done. Stir occasionally. When done, a knife should go in easily and the wine should have reduced to a thick syrup. Serve.